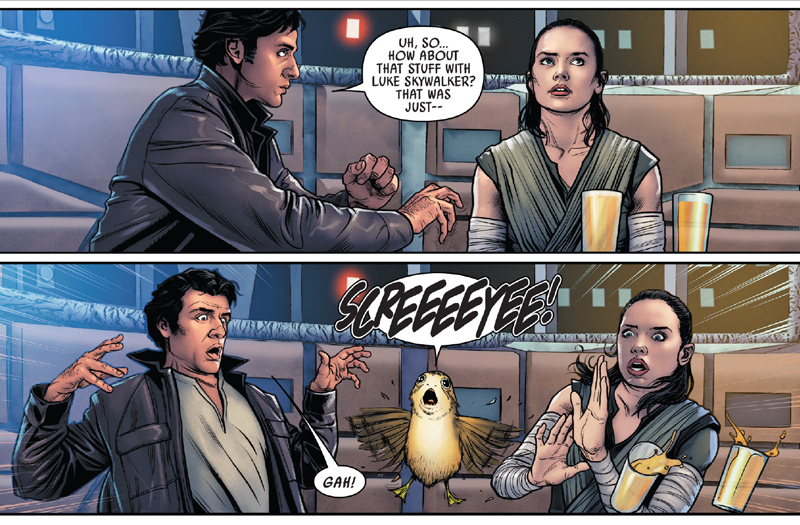 Like the issue before it, Poe Dameron #27 — by Charles Soule, Angel Unzueta, Arif Prianto, Rachelle Rosenberg, and Joe Caramagna - has a post-Last Jedi frame that's rooted in Poe telling Finn and Rey about his exploits during The Force Awakens. Although this issue is not as focused on the past, this time we get another bit of unseen insight into the events of the story in the form of the reconnaissance mission that Snap (and his wife and fellow Black Squadron pilot Karé) took to scout out Starkiller Base. But really, the focus of this issue is the small bonds being reforged and renewed between the straggling survivors of the battle of Crait. 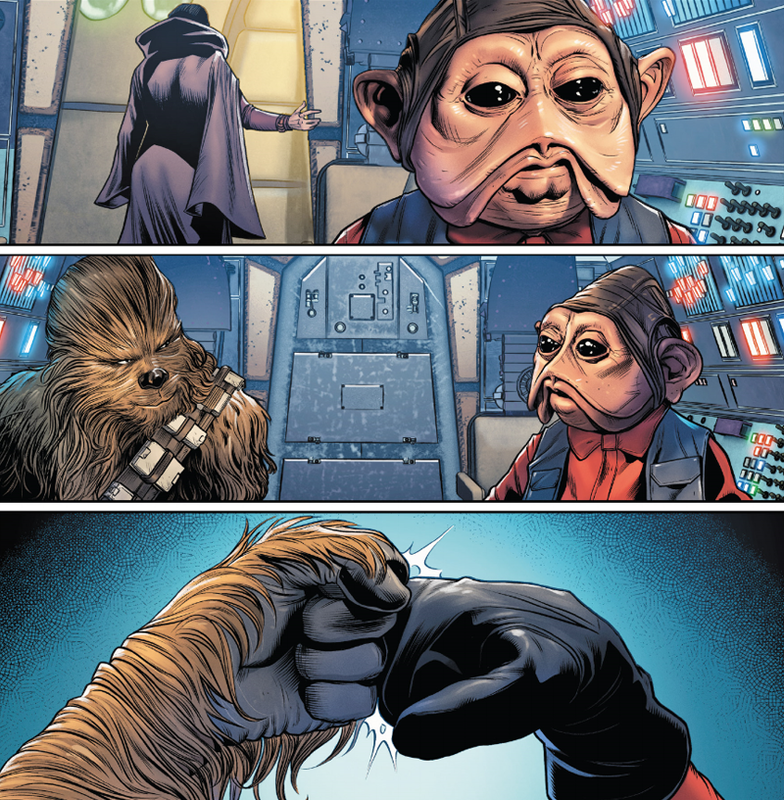 The opening of the issue balances an aching heartbreak of Leia, sitting in the cockpit of the Millennium Falcon and remembering Han, with an adorable moment shortly after of Nien Nunb walking in, taking her seat, and offering a "co-pilot of the Millennium Falcon" fistbump to Chewbacca. There's a solemnity that underscores each of these interactions, given what we know these characters all just went through - especially Poe, Finn, and Rey. 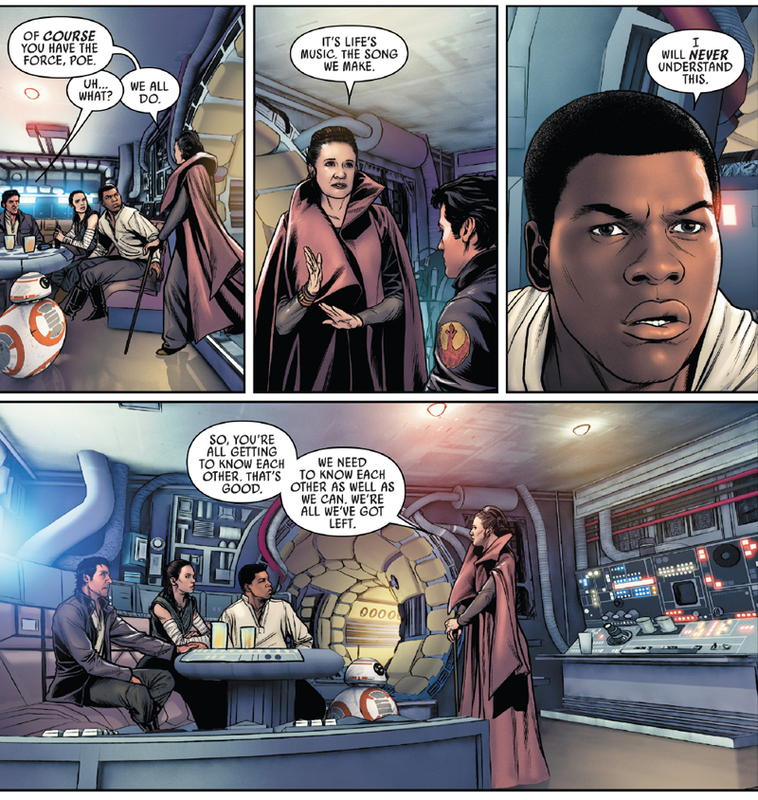 When Finn briefly leaves the conversation between his friends to check on the injured Rose, there is an awkwardness between Poe and Rey that hints at both their relative newness to each other. But it also highlights the fact that what they all just witnessed - the final moments of the legendary Luke Skywalker - is this unavoidable spectre hanging over what's left of the crew currently on the Millennium Falcon. ... Even if they're interrupted by a porg during the uncomfortableness of it all. Coming out of The Last Jedi, little remains of the Resistance - and two of its potential greatest heroes, Han Solo and Luke Skywalker, are no more. Now, more than ever, they need to come together, to get to know each other, because those tiny little bonds are all they have left in their fight to survive the First Order. 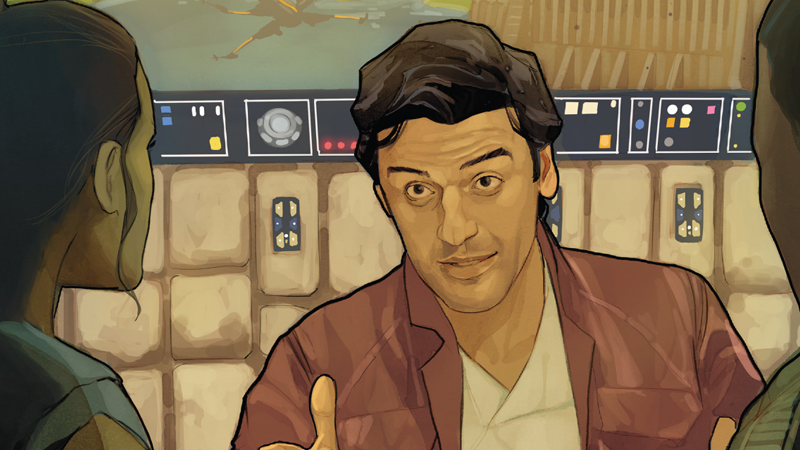 Moments like the ones in Poe Dameron #27, caught even in the wake of such huge losses, are just the start of that process.